The Strobepro 13 foot 2-in-1 Photography Boom Light Stand Kit is an amazing value. Compare the Manfrotto 420CSU at $285 and you won't believe the quality of the Strobepro 13 foot stand! Easily use it as a heavy duty 13 foot light stand or it converts in 5 seconds to a Boom Arm Light Stand, capable of supporting an 11 pound load overhead. Reversible spigot 1/4" or 3/8"
The 13' rotatable boom light stand is awesome! 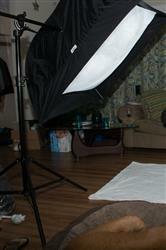 I got it to use with a speedlight setup in a Wescott Apollo 50" softbox. It's the only boom setup I've tried, but works well. It was a little tippy, but thats to be expected with that big of a box, 2 speedlights, and triggers hanging off the end of it. Seems to be quite durable from first impressions. I love that everything is metal! The only thing I would say is if you have the room, go for the 16' if you want more options/versatility. Works great! Solid build quality. Best lightstand ever. Versatile and perfect for every use imaginable. So far great! Well,made, sturdy, easy to operate.